Need to Save Money on Home Security Lighting? Welcome to the Powerbee range, easy to fit, energy efficient super bright PIR Sensor led floodlights, designed for the UK Including UK Winter Time. Indoor & outdoor motion activated FloodLights, powered by solar, battery & mains, establishing a balance of power & efficiency. These lights are all fitted with a PIR sensors, which when detect motion automatically illuminate to shine bright light where you need it. Adjustable time, sensitivity and dusk options are available. PIR activated lights are considered by experts to be excellent for crime prevention. In most cases there are simple dials on the sensor, you simply turn the dial to increase or decrease that particular setting. In most cases the amount of energy used to operate leds is 10 times less than halogen, but the coverage area is the same. So if you are a family with lots of visitors or children, the units will actually pay for themselves! The battery and solar powered lights, do not need an electrician to fit them & can be installed in minutes. This option offers a very fast practical solution to increase your home security. The solar versions are complete kits you only need a screw driver to fit them, everything is included. The panel just needs to be placed in a bright area of the garden for them to work all year round. The battery operated ones can be placed almost anywhere and just need batteries to be installed. They offer you almost instant protection anywhere you need. They offer surprisingly bright output some touching 1000 lumens, enough to illuminate 100 square meters. This option can save a lot of time and money on installation, and they have very little or no maintenance costs. 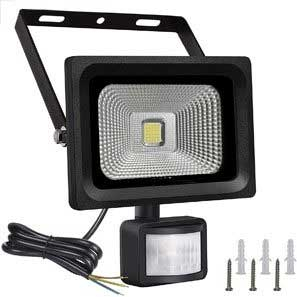 Keep Your Home & Garden Safe with a PIR Floodlight. Perfect for home, offices, garages, sheds, driveways, alleyways, & pathways, they are surprisingly bright, very economical and provide you with a real sense of protection. Garden security lights are fast becoming an essential lighting solution, to keep your garden outdoor valuables and home protected. At dusk when motion is detected, the PIR (passive infra red) will automatically illuminate the Led's. Ideal for lighting up paths, and navigating around your garden when it is dark, they also effectively deter intruders. General safety around the home is also increased, branches from trees, hoses and rakes strewn across paths and other trip hazards can cause accidents. When there is sufficient lighting the probability of a trip accident is greatly reduced. It is also a great luxury to be able to walk around your garden and home at night time hands free. No need for a torch or lantern, the path is lit automatically. Install Exterior Flood Lights & Prevent Crime. They are designed to work all year round in the UK, making them perfect for crime prevention. Led's require far less power than halogen mains lights, but give off an equivalent light. A criminal will always favour an unlit property, if you have motion activated Sensor Lights, the intruder understands that your property has added security. A motion sensor led floodlight gives you peace of mind, keeping your home safe and secure, and acts as a great garden path light. Its nice to sit back and know that you have reduced the risk to your home, and also that if you want you can wonder outside whenever you feel like it. Proven in many studies to significantly prevent crime, motion sensor Lighting is environmentally friendly. Helps cut your energy costs, saving you hard earned money. Our security lighting range is at a minimum IP44 rated, guaranteed to last for years to come, whether in 30 degree heat or blizzard conditions. Some of our first customers have security floodlights that are still going strong. We have a very large loyal customer base, who once buy from us, tell us they will never buy from anyone else again! Powerbee began selling garden lighting over 10 years ago. Many advances in technology have been made since then. Greater outputs using SMD technology and more ergonomic & efficient designs have now made it possible to reduce costs. Now everyone can afford home protection. Here at Powerbee we are all about energy conservation, we believe that a Halogen bulb as a light source is a waste. SMD LEDS are just as bright, and take far less energy to run and the bulbs last longer, this is why we do not to sell any Halogen bulbs. Led Motion Sensor Lighting is designed to provide ample enough power to get the job you need done. One 50 watt led light is equivalent to 300 watts of halogen bulbs and costs over 5 times less to run. We believe its best to buy a product that has been optimised for efficiency. We have sourced our products very carefully to maintain a balance between function and cost. When installing your motion detector garden or driveway security lighting outside, use energy efficient leds with a pir sensor and save yourself a small fortune.